The kids are about to be out of school for Thanksgiving and you may be wondering what to do with them. 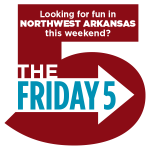 Never fear, we have lots of ideas of family events in Northwest Arkansas this weekend. For more events in the month of November, check out our November Calendar of events. Plus? 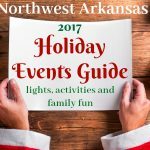 All the holiday events start this weekend, including the lighting of the Fayetteville Square tonight, SANTA ARRIVES at the Northwest Arkansas Mall tonight, the ice rink at Lawrence Plaza opens on Saturday, the Stewart Family Lights Display flips the switch on Sunday — and the NWA Boutique Show is today and tomorrow (find us at our booth in the back)! 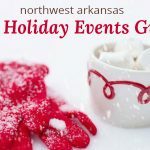 CLICK HERE to see the big NWA Holiday Events Guide, including where to see Santa, cool light displays,shopping events, live Christmas trees and more! 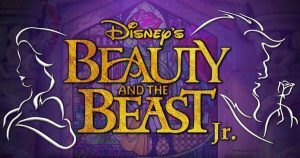 The classic story tells of Belle, a young woman in a provincial town, and the Beast, who is really a young prince trapped under the spell of an enchantress. If the Beast can learn to love and be loved, the curse will end and he will be transformed to his former self. But time is running out. If the Beast does not learn his lesson soon, he and his household will be doomed for all eternity. 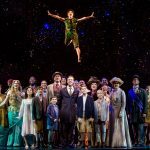 Appropriate for all ages, 60 minute run time with no intermission. #JCmovienight is back for Season 3. November’s movie is a kid-favorite, Cars 3. This totally free movie will be screening in the Jones Center auditorium. Part scavenger hunt, part food drive, part bike ride. As a grass roots event, Cranksgiving allows the cycling community to give back to Northwest Arkansas. 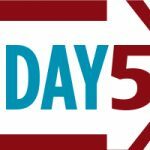 Navigate the streets of Northwest Arkansas and the aisles of grocery stores searching for specific food items. Once you’ve found them and made your way through the checkout lines to the finish line, all of your food will be donated to CARE Community Center and given out to families in need of a Thanksgiving meal. So bring your bike, a bag, and let’s have some fun while we give back to our community. Cranksgiving is an all ages family friendly event. There is no registration fee to participate. A special Storytime in celebration of Thanksgiving. When Bear decides to throw a feast to thank his friends, they show up one by one with different platters of delicious food to share. There’s just one problem: Bear’s cupboards are bare. What is he to do? Find out at Storytime, with activities to follow. In the classic and beloved E. B. White story, Wilbur, a little pig with a big heart, becomes famous with the help of his clever friend Charlotte and their chatty animal neighbors. 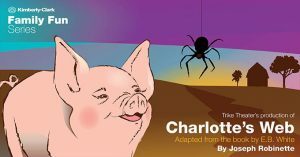 Wilbur, the runt of the litter, struggles to survive from the very beginning, but with the help of his barnyard friends, Wilbur becomes the prize-winning pig of the County Fair and the most famous pig ever. Trike Theatre brings to life the gentle story of friendship, loyalty and truth, reminding us that friends come in all shapes and sizes. This weekend you can hear Foggy Bobcat (Friday night, November 17 at 8:00 p.m.) and Kimra (Saturday night, November 18 at 8:00 p.m.). They also have Taco Tuesdays, trivia nights and book club events during the week! BAX has a new event every Thursday called Sip & Stretch Cider and Yoga Night starting at 7:30pm. Black Apple Crossing is the state’s first cidery. It’s located in downtown Springdale off Emma Avenue just past mile marker 13. Black Apple Crossing has produced naturally gluten-free hard apple cider with no added sulfites or other preservatives since July 2015. Click here to visit the Black Apple Crossing website. 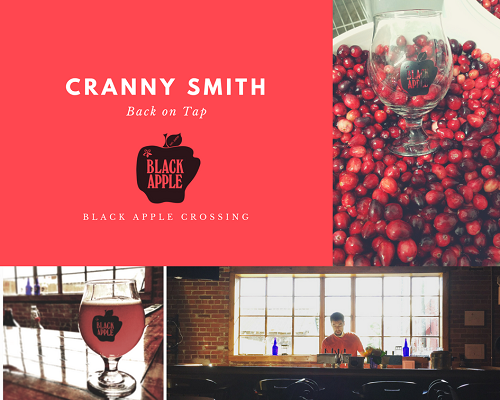 The tart cranberry cider, The Cranny Smith, has returned. On tap now!